There is an interesting story today in the Wall Street Journal about the “pencil wars” between two historic German companys in our industry. Who’s the oldest? Who’s the best? Who’s the most innovative? Interviews of Count Anton (Toni) Faber-Castel and Axel Marx current MD from Staedtler. I wrote a related post a few years ago about all the pencil company’s vying for the title of having produced the biggest pencil in the world. All in good fun. It’s nice to see some mainstream press coverage on the pencil business. Coincidentally, I was just interviewed yesterday by a writer from the Boston Globe who is working on a story about our relaunch of the Blackwing pencil. Rather than continuing on schedule with previously planned posts about our design and development process I thought I’d respond to all the inquiries we’re getting about when we’ll actually begin taking orders for the new Palomino Blackwing. As previously announced, last week we received the expedited air shipment of the first part of our initial production run. Unfortunately final packaging has not yet been completed. Due to customer requests for the new Blacking pencils we have decided to launch without final packaging. 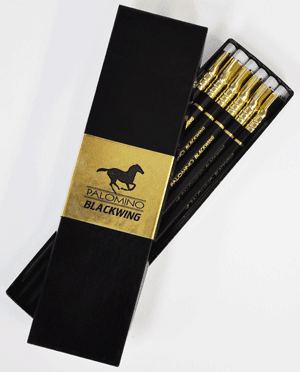 Customers who wish to purchase the Palomino Blackwing pencils immediately will receive them in a black gift box (see top photo). We expect to put these up on the site for sale sometime next week pending some other final details we are working through at the moment. We will also offer bulk volumes in our standard one gross quantity boxes (144 pencils). Availability of the Blackwing packaged in our traditional banded dozens format should follow within another two weeks thereafter. We expect to be able to offer the Palomino Blackwing pencils in the final 12 count package by the end of November once the balance of the initial run pencils arrive from Japan. The image here shows the latest mockup for this box which has taken into account feedback we received from many of our questionnaire respondents to go with more of a typographical treatment in our package design. We think this is tastefully reminiscent of the classic Blackwing package, not a copy by any means, but fresh and updated to complement the style of the new Palomino Blackwing. We are also in the process of designing new retail packs for the balance of the Palomino product range. This should allow us to begin focusing on some retail placement for both the new Blackwing and broader Palomino product range in early 2011.Additionally we have just worked out details to produce a limited run of high quality wood box desktop sets especially designed to include 24 Blackwing pencils and a Palomino-KUM long point sharpener. These should be available mid to late November. . . just in time for Christmas.Finally, we are still also working through a few final costing and pricing analysis details so will not provide pricing on these new items until we go live with sales next week. Honestly, there was indeed a debate about whether to include this phrase long associated with the Blackwing on our new pencil. Many Blackwing fans seem to feel quite strongly that this slogan should have been used and do associate this slogan directly with the pencils smooth writing performance. One person even referred to our new Palomino Blackwing version using the phrase “One Quarter the Pressure, Twice the Speed” to indicate that, in his opinion, it was smoother than the original. I have nothing against a good marketing and promotional slogan and I certainly recognized beforehand that “Half the Pressure, Twice the Speed” is loved and well respected. However, I’ll admit I never really understood the logic of this slogan from a purely technical standpoint. Increasing downward writing pressure quite obviously increases friction and thus would slow down the gliding of the pencil across the paper with a given amount of lateral force. The inverse is true as well, reducing pressure increases speed. Thus when applied to downward writing forces this slogan is essentially true regardless of the quality of the graphite and how smooth it is in relation to the graphite cores of other pencils. Alternatively, looking at varying degrees of lateral pressure being applied with a fixed amount of downward force, as smoothness increases the same lateral force certainly would increase speed and I can see the logic that reduced lateral pressure might maintain the same speed, but not necessarily double it. Who can write or draw legibly twice as fast anyway? So it did not strike me as a particularly appropriate slogan when evaluated purely from an scientific, literal standpoint to represent comparative performance advantage versus other pencils or even just smoothness in general. Obviously this is a very theoretical discussion for what really ultimately has more to do with consumer perceptions. I doubt Eberhard Faber ever conducted any studies to scientifically measure and demonstrate smoothness before coining the slogan. Looking up the word “smooth” in the dictionary yields several appropriate synonyms which have been applied to the Blackwing Pencil at times “soft”, “silky”, “velvety” and “effortless” being among the most common. From the concept being portrayed that the Blackwing pencil is more effortless to write with, then the idea that reducing pressure corresponds to a dramatically increased speed may be interpreted that the pencil has characteristics that defy natural forces thus imparting a super-natural type quality. Perhaps this is closer to the originally intended meaning and interpretation for this phrase than my more literal view expressed above, it’s certainly a romantic one. In any event I have no idea who to credit for the inspiration and genesis of the “Half the Pressure, Twice the Speed” slogan. Perhaps it was simply the Mad Men. Who knows? From a trademark perspective it does not appear that Eberhard Faber ever took action that we could find to protect this phrase. During our cursory evaluation of this topic with counsel we came to no conclusive answer whether it would be worth the effort and expense and if it would ultimately successful in being granted a trademark. Certainly we could have used it without taking such steps but for this and other reasons chose not to. We did consider alternate slogans that I felt would more directly reflect the Blackwing’s smooth writing performance and would also improve linkage with some of the existing “slogans” related to the Palomino’s performance. (e.g. Ride the Palomino, the smoothest ride around. Or alternately, Smooooth…!, which came from one of our fans in an animation about the Palomino). We’ve also since had several suggestions including some of my favorites: Fast as Light, Dark as Night and Back in Black. Ultimately we rejected printing any slogan as a matter of the economics of dual side printing, and a desire not to offend those who may not like a changed slogan and also consideration for trademark concerns. As we look ahead to future production the decision of whether to use the “Half the Pressure, Twice the Speed” slogan is currently under re-evaluation though perhaps alternately we should just hold a proper contest for a great new slogan unique to the new Palomino Blackwing and a new generation of pencil fans. Once concept now under consideration is to produce a separate SKU as a classic reproduction version, though when or whether we could support multiple Blackwing items in the line over time really has to be seen with how sales go as we move through the fall. 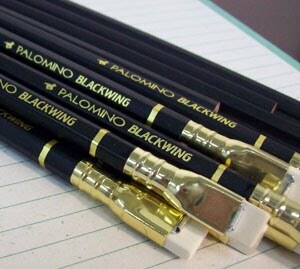 We are now working on last few details before putting up the new Palomino Blackwing for sale on Pencils.com. Ultimately, as we all now understand the story, the breakdown of the specialized ferrule production equipment and the costs to repair or replace the machine factored in the decision by Newell Rubbermaid (Sanford) to discontinue the Blackwing. The economic return did not seem to cover the cost of restarting production given the limited sales for the product and the company’s primary focus on mass market products. Of course, I also doubt anyone ever expected pencil aficionados would eventually be willing to pay from $20 to $40 each for these pencils down the road either. It’s an interesting speculation to consider if armed with such knowledge what new pricing they might have been sufficient to justify the repair or replacement of the machine and continue the product at that time. Who knows if anyone performed such an analysis or just looked at the unit volume and decided to call it quits? Bringing back the classic ferrule with its flat rectangular, extendable eraser was a key factor for me in deciding to move forward with the Palomino Blackwing. As some fans have noted the Palomino, Mitsubishi Hi-Uni, Tombow Mono, or Staedtler Lumograph brands each have specific grades that compare rather closely to the original 602 performance. Therefore at least to me, without this classic ferrule and eraser design included there could be no return for the Blackwing brand. Finding a vendor that would agree to reproduce the functional eraser assembly to our desired quality standard while protecting our tooling investment and not allowing reproduction for other pencil manufacturers was important to me. Another key decision factor was to obtain a reasonable economic cost relative to standard tipping, even though it was clearly always going to be much more expensive per pencil than regular erasers. Important considerations became the tooling costs investment to be able to produce the assembly components as well as the appropriate minimum order volumes for a given unit cost. Discussions and investigations on this actually took place over a period of a year or more. We did commit however to the tooling cost early on to produce the ferrule (well over a year ago) just so that we could begin to produce some test samples. At one point after we had paid for the tooling we we’re told we would have to move our original target minimum order size for our first order from 50,000 as originally quoted to 500,000 pieces if we wanted to keep the price unchanged. This just about killed the whole project and created long delays as we assessed whether to proceed or not, considered alternate options and negotiated further. By the standards of most commodity oriented good quality, high volume cedar pencils (e.g. Ticonderoga or Mirado) selling at or around $0.20 to $0.25 each 500,000 pieces is not a very high production figure at all. However, for a niche, high quality item we expected would ultimately have a retail price point, somewhere between $1.50 to $2.00 per pencil, this could be a significant initial inventory investment just for these assemblies, depending on ultimate acceptance of the product. This also raised concerns such as eraser life if initial sell through was not very good. In the end we were able to settle on an initial production run of 100,000 ferrule/eraser assemblies and this coincides with the number of pencils we are producing in this first run for the Palomino Blackwing. Feedback on the eraser assembly and performance overall has been positive overall. Several reviewers have noted the exceptional care with which the ferrules and erasers are glued, rather than crimped on to the pencil mechanically, and that the flat side of the ferrule/eraser set is oriented so that the imprint is face up. This is not the case with the original Blackwing which has random application angles. In reality the end of each pencil is actually machined down slightly before attaching the eraser assembly vs. standard eraser tipping which more commonly slightly crushes the wood before attatching and crimping on the ferrule and eraser. 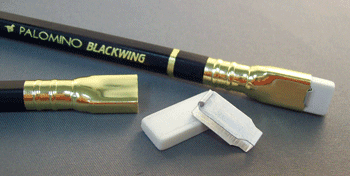 The Palomino Blackwing erasers are about 25% larger in total cubic volume and 15% wider than those of the original, providing improved eraser surface area. They are also produced with improved materials than the natural rubber/pumice composite materials used in the original Blackwing’s erasers. Here I’d like to add a technical note as there have been several comments on blogs referring to the Palomino Blackwing’s eraser as a vinyl eraser. This is not the case and is an inaccurate assumption on the part of those individuals. While vinyl based materials did become more prevalent for art and pencil top eraser use as a replacement for traditional natural rubber based composites, vinyl erasers are actually currently in declining use by the industry. Our erasers are produced using Thermoplastic elastomere (TPE). Thus they are more appropriately called polymer erasers vs. vinyl erasers which are produced using PVC material. The change to TPE from PVC was initiated by the industry to eliminate chloride from the production process and finished product. The vinyl erasers that are most commonly used today are larger hand held block eraser formats. Most pencil top erasers from major brand manufacturers and all those we use in our California Republic product ranges are polymer erasers, even if they are other colors such as more traditional red or pink. For an interesting history of the eraser and technical information about the different materials used over time Staedtler has a very useful resource guide, here.We did get some feedback that with our darker lead mark than the original Blackwing, erasing with our new eraser still leaves a slight trace of a smudge, or “ghosting”. This is another issue we are re-evaluating for future production and are now told by our supplier there is an opportunity to improve on this versus the current eraser we are using in the Palomino Blackwing. However, we have not had a chance to evaluate cost differences or do any actual testing. 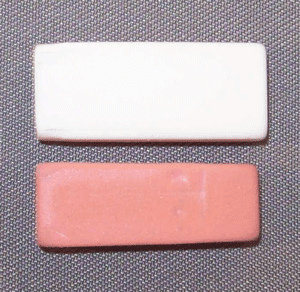 The current eraser is the same quality as that used on our Palomino HB pencils.Finally, some traditional fans do seem to prefer the old pink eraser color versus the white version which we selected. Others have suggested black would be very nice as well. Color of the eraser specifically is not really a factor in it’s performance though it seems to be a common misconception that a white eraser works better than a red or pink eraser. It all comes down to materials. Performance differences with the original Blackwing certainly have something also to do with the age of these older pencils and the effects of oxidation and exposure to light. At this point I cannot indicate if there will be an eraser color change down the road as this is dependent upon what future cosmetic design changes we might implement for the pencil overall as well. This feature set was considered the fourth most important across our six features ranked by our test groups. Here there is a clear allegiance among traditional Blackwing fans to the historic charcoal or graphite gray gloss finish and imprinting information on the pencil to more closely match that of the original product. Many participants readily admitted technical and overall usage performance is the most important factor, but given a preference they’d go with a finish treatment close to the original 602. Some commented that the Blackwing font itself is different than the original. We did initially try to match exactly the original Blackwing font. During our detailed research on this topic we could not find an exact match, but we learned that it was a variation of a very old German font, which makes sense given the heritage of Eberhard Faber. We selected a more updated font that matched as close as possible without going to more expensive and time consuming efforts to have a designer create an exact match. Additionally, there have been quite a few suggestions to increase the size of the Blackwing name relative to Palomino to make it more characteristic of our treatment of the Palomino brand relative to California Republic brand on our Palomino pencils. The relative font size is a valid point and probably will be corrected in future production pending assessment of some related technical and marketing factors as we consider potential redesign.My personal view in designing the new Palomino Blackwing pencil has been that a product named Blackwing logically should be finished in black. As mentioned in an earlier post I generally agreed with finish recommendations suggested in that Frankenpencil post and this to some extent guided thinking on this design, though admittedly Lisa was not talking about a new Blackwing pencil, but her ideal “Frankenpencil”. In any event it seemed there was quite a lot of interesting and supportive discussion around this post and with some of these design characteristics so it seemed appropriate to incorporate some of these into our design. The addition of the gold band was simply to keep some added Palomino brand family connection in our pencil range design. Some people have commented they feel the gold band is too much of a departure from the original. Unfortunately, once the initial production began and we later received a couple hundred samples we noticed some very faint foil speckling occurred during imprinting and these tiny foil flakes had been sealed in when the sealer coat was applied. This covering quote was originally intended to protect the foil imprint and band from any further wear from continuous handling during use as is occasionally noted with respect to many pencils. It’s not a process we do with our existing Palomino products and probably should be eliminated for future production. Though we felt the pencils looked very good overall we were not fully satisfied with this characteristic as compared to the samples we approved before initial production. I actually stopped eraser tipping production on the balance of the pencils, but by this time all of the initial production pencils had been imprinted and sealed. My concern was do we release “as is” or not and it was at this time I determined to do a consumer sampling and evaluation to get a gauge on this issue. Among our options was scrapping the initial production and going back to design table before actually launching the product as well as evaluating other potential fixes. I determined this process would be a good opportunity to get broader evaluation of the product for ideas we could incorporate if we ended up doing a complete re-start or to be used for future design modifications if we ended up launching “as is”. After three weeks of feedback, we have now determined to proceed with the launch of the product “as is”. There were several decision factors, the first and most important being the overall positive response we’re now seeing to the Blackwing Palomino when considered across all of our evaluation groups. Despite a clear preference by many traditional fans for a more classic design and some indications the finish quality is just not quite up to par with Palomino, it appears we have developing demand now with people pressing us for pre-orders regardless of finishing characteristics and we learned that these characteristics consistently did not rate as highly on the scale of importance vs. other product features. Another major factor was that we subsequently determined that going back to the drawing board on design would result in a more extensive production and launch delay than originally anticipated, probably until mid to late 1st quarter 2011. This relates to scheduling issues with our subcontractor as well as to allowing adequate time to address the redesign process, including potential fine tuning of the graphite core formulation. Of course the cost of scrapping or reworking any of these pencils into other products from the initial run if possible was also a relevant decision factor, but not the first priority. I was fully prepared to scrap if I felt this was absolutely the best decision going forward and I’ll stress that our final decision was not self-evident at the point we began the evaluation process.As previously mentioned we are now moving forward with expediting market availability of the new Palomino Blackwing from our initial run. We expect to have more definitive information next week on pricing and order availability. In the meantime we also have a breif update to our Coming Soon page. Overall, in our Palomino Blackwing bench test graphite smoothness and graphite wear came out as the first and third most important features of the six specific product features our survey groups were asked to prioritize. The second most important item was considered to be the overall performance of the pencil as a whole. We did not list graphite hardness or darkness as performance features to be rated since these are generally related to wear rate. We did get specific qualitative comments and feedback related to hardness and darkness which we have evaluated as part of this assessment. Realistically, as much as we all like seeing those images of writing, sketching, and shading and cross hatch gradations, etc. on all these blogs reviews these only serve a limited visual purpose. They do not technically demonstrate smoothness of the core as much as variations in darkness and overall density of graphite mark. They are simply a record providing evidence of a process of personal evaluation. Perhaps if enlarged enough one might notice respective comparable differences and gradations of fineness in the consistency of graphite material being deposited throughout a stroke across the paper. As my high resolution digital SLR camera was stolen recently and my replacement not yet arrived we’re just using some simple images in this post, others have already well documented their own experimentations. As I’ll discuss a bit further in a few days when we cover the topic of “Half the Pressure, Twice the Speed” we are not aware of any objective, scientific test equipment used in the industry today for measuring “smoothness” of graphite writing cores. So when it comes to smoothness we must rely on the more subjective experience of our test group, our own personal comparisons and the experience of our supplier. Our control group of experienced Blackwing 602 and other pencil users provided a broad range of feedback on this topic as would be expected. Every individual experiences the tactile and sensory act of writing and drawing with a pencil through their own unique perspective; writing pressure, hand and point positioning vary and is not always consistent even by the same person or differing uses such as drawing and sketching vs. writing. Comments posted on Lexikaliker even mention differences in point angles used for writing in different languages or alphabets . Additionally, variations in the graphite cores of original 602s from different production periods mean some respondents had different reference points for the original Blackwing’s performance. Older Blackwing production dating back to the 1930s exhibit softer-darker cores and more recent stock produced up through and into the 1990s are generally harder with a lighter mark. Unsurprisingly, the range of test group scores on graphite smoothness had the highest deviation of any feature rated. This clearly reflects the higher level of subjective feel and preference to this topic from user to user. We also received some questions regarding whether or not we acquired the original formulation and if not why not produce an exact match for the original graphite core down to every last performance detail. Let me state that we have not purchased any technical knowhow associated with the original product specifically including the formulation for the graphite core. The Blackwing has not been produced now in about 12 years. The Lewisburg factory which last produced these cores and finished Blackwing 602 pencils was closed a year ago and production relocated to Newell’s Mexicali facilities. Additionally, our experience is that there has been a high level of turnover in company management and technical personnel over the past 15 years as new acquisitions were integrated, product lines and manufacturing rationalized, successive cost reduction programs implemented, etc. Quite often the most knowledgeable person with respect to production of items such as graphite cores is the actual worker on the production floor. Here formulations may be adjusted based on variations in inbound raw material quality and specific equipment used according to specific knowledge of those floor workers to maintain product within a specified quality range. Given the changes in that company over more than a decade it’s not clear such knowledge and equipment setup at Newell currently exists to perfectly duplicate the original Blackwing lead. Perhaps there may indeed even be a file cabinet somewhere with the specific product formulation; even so it’s unlikely we could have purchased this.So why didn’t we exactly duplicate the formula through reverse engineering with our very experienced supplier in Japan? This is a reasonable question. However, not a simple and inexpensive process, particularly for a product that was traditionally a low volume niche item. The last producer ceased production partially because a machine simply broke. Returning an investment on a niche item becomes an increasing challenge as total development costs increase. While designing our new product, in choosing between “smoothness” comparability vs. “darkness and wear”, I have always believed that smoothness matters the most in matching the Blackwing. Also, as the Blackwing was a traditional favorite of animators and illustrators – where a nice smooth and dark mark is important to these users – I felt best to err on the side of smoothness and softness of feel over an exact hardness & wear match. So in the end we’ve chosen a close match to the original given the higher weighting we put on “smoothness” and also considered where this particular core would fit in relation to our existing Palomino graphite grades. Our overall consumer feedback supports that we have a high performing product reminiscent of the extremely smooth writing performance of both the original Blackwing 602 and comparable to our Palomino quality range. In conclusion, there seems to be some general feeling that if we can improve on the wear rate while maintaining the current smoothness that would result in an ideal lead, though clearly we have received high praise for the product as it now is as well. It’s not clear to me if the mark on paper being darker for some people is a specific criticism or simply a byproduct of a slightly softer lead. Despite the technical and cost challenges I’ve just noted, we’ve already taken some initial steps to investigate possible modifications to address hardness and wear without compromising smoothness to see if we can get to a more exact match to the Original. Indeed, we’ve begun preliminary testing with our supplier on another formulation that could be promissing. We have not received pricing information and no decisions or very thorough technical evaluations have been completed at this point in time. We will have to keep you all posted on this matter as this develops. Welcome back. I hope that you’re enjoying this series of posts as we explore our company’s journey to revive the Blackwing. (To catch up if you’re new see Post One and Post Two) As promised today is the day I’ll begin focusing on our growing understanding of the traditional “Blackwing” fan and their concerns and feedback as we’ve been going through our consumer evaluation process of initial Palomino Blackwing production. Right from the start it was clear that we had a core challenge to address in reviving the Blackwing: How to please the traditional fans with a product that honors the “original” while also developing a new Palomino Blackwing product that complements and extends our Palomino product range and can become economically successful. Ultimately, we developed and produced the product that has been distributed for these consumer evaluations. This product is in part based on my research on the internet of many, many posts about the Blackwing over the last several years. 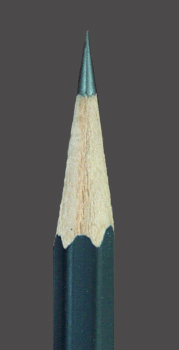 One interesting post related to designing the ideal pencil was Frankenpencil, originally published by Lisa Laughy on her Ninth Wave Designs blog and archived today in the Pencils.com community site. I also considered economic factors, design trends and perhaps a certain degree of personal preference in creating a product that I believe can ultimately be successful as well as share some consistent design elements with our Palomino product range. So far there has been a strong overall response to the Palomino Blackwing by our testing groups and those requesting preorders. We’ve had scores of e-mails from those ready to buy the product as is now regardless of future changes we may implement, the color of eraser, finish, etc. However, it’s clear from the feedback we are getting on our surveys, blogs and e-mails that many traditional Blackwing fans expect or have a strong preference essentially for almost an exact duplication of the original Blackwing down to the finest of details. Stephen’s Pencil Talk review posted over the weekend, shows the amazing level of detail some Blackwing fans are going to assess this new item. Even down to weighing differences in erasers on a scale and enlarging images of the imprint by 50x or more . I am not sure any wood cased pencil ever has had such a degree of public scrutiny by end consumers before being introduced. Pencil Talk raises the valid comment that our new pencil is not a clone of the original, but a modern interpretation. I think this is a fair representation given my stated intent to “honor the original while extending the Palomino range”.As good as our new item is the most unwavering Blackwing fans seem to consider it near heresy if we do not provide an exact match to the graphite writing and drawing performance of the original as well as the design and look of the finish, eraser color, etc. Thus some even feel this pencil fails to acheive the goal of “honoring the original”. Clearly the smooth writing and drawing graphite performance has always been the most important quality feature, but there are many strong emotional attachments also to the original’s lacquer finish, it’s pink eraser assembly and perhaps more importantly to the phrase “Half the Pressure, Twice the Speed.” One or two even mention the painted band on the ferrule is preferred, though not all versions of the original had this feature. Most traditionalists are very happy that we revived the original classic ferrule and eraser design with the flat, removable eraser and believe we’ve improved on the original in this area.My next post will begin to address the specific feedback on product featuers and performance, starting with Graphite Performance, and moving on in successive topics daily this week. 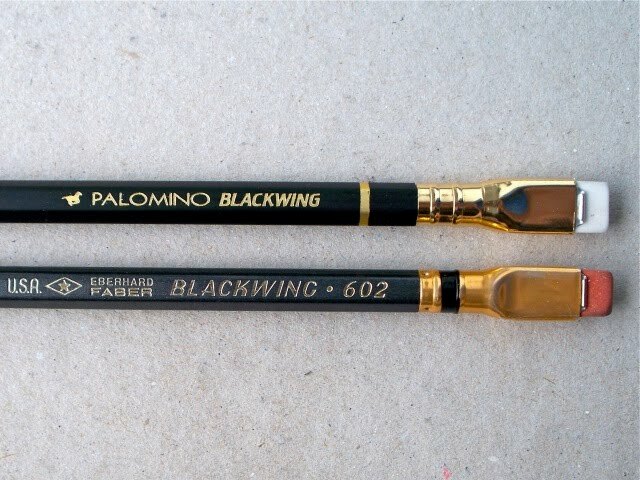 In the meantime we’ve now also set up a new Palomino Blackwing page on Pencils.com to serve as a central point for information on this pencil including updates on product availability. Reviving the Blackwing: Why take on this Challenge? Pure and simple. Blackwing is a great and iconic name among serious pencil fans. Revered for its legendary smooth writing performance and classic extendable rectangular eraser it’s become known as the pencil of famous animators, illustrators, musicians and writers as well as those who simply appreciate the best. The Blackwing’s lore has increased since production was discontinued in 1998, creating an “old stock” eBay market bearing prices from $20 to $40 per pencil. This pencil is kept as a collectable or stingily used only for special creative activities. All other high quality graphite pencils seem to be compared to the Blackwing as the standard of perfection.Anyone crazy enough to try to build a new brand name in a rough and tumble globalized commodity business like the pencil industry is always going to want the best advantage possible. Very few pencil producers really professionally and effectively advertise and market pencils anymore. The closest promotion the average consumer is exposed to are circular ads of mass retailers and office superstores offering “loss leader” prices during back to school time to get people in the door. They’ll give away $2 of pencils at or below cost to sell that $10 to 20 calculator and other goods that makes them much higher margins. The cost pressure from the large retailers drives producers towards an obsessive focus on the economics of pencil production. Over the last 20 years, this has resulted in a reduction in the general quality of pencils and outsourcing overseas while cutting marketing support dollars and manpower devoted to thinking creatively about pencils. The benefit to society is a lower cost product on average when it comes to pencils. The cost is a loss of understanding and appreciation by the average pencil user of what a good quality pencil really feels like to use and how it performs. The proof, put a Palomino, a Mitsubishi Hi-Uni, a Tombow Mono or a Blackwing in the hands of the average person and ask them to compare side by side with their normal everyday pencil and watch their response as they write, doodle and explore the fine writing characteristics of these pencils.Since we launched our California Republic range my vision has been to establish our premium quality Palomino brand as fresh, new and fun, with great quality and safety performance. This has been a gradual and experimental process mostly conducted over the internet and in my spare time when not attending to our core slat and firelog businesses. Nevertheless we are building a small, but growing fan base and our recent Pencils.com website redesign is helping to move this ball forward with our “Freedom of Expression” theme as well as expanded features and products. In our view the pencil is perhaps the most common and affordable tool of creative self-expression used around the world. It may not have the reach of the internet, but there is a personal sense of connection to writing, drawing, sketching or doodling with a pencil that for many cannot be matched by typing on a keyboard or drawing with a stylus on a computer screen. For us, Palomino is an important part of enhancing “freedom of expression”, but we know finding your favorite instrument of self-expression is a personal journey and so in time we’ll be featuring even more pencils from other producers who use our slats in our store. This also helps promote quality wood-cased pencils in general and provides a new and creative means to support our slat customers, something CalCedar has been devoted to for over 80 years. Ultimately, however to make Palomino and our California Republic family of products economically successful brands, an added catalyst is needed to move the ball forward.Ever since we introduced the Palomino it has regularly been referred to by many Blackwing fans as a principal contender for successor to the original 602. These fans continually lament the ceasing of production of this pencil and the increasingly high cost of “old stock” on eBay. When I discovered the Blackwing name was available it was a natural choice to want to more closely associate this venerable name with our own brand. The goal: Create a Palomino product line extension that honors the performance and functionality of the original Blackwing 602 while building a new and expanding generation of pencil lovers who appreciate fine quality pencils. Who would not want to pursue this opportunity? It’s both tremendously fun and challenging. If we’re right, execute well, and perhaps a little lucky, then maybe we’ll make some modest financial return and turn a passion into a profitable business venture. http://calcedar.com/wp-content/uploads/2010/09/palomino_blackwing3.png 114 350 WoodChuck http://calcedar.com/wp-content/uploads/2017/02/logo.png WoodChuck2010-09-09 16:55:002017-02-23 18:00:56Reviving the Blackwing: Why take on this Challenge? Reviving the Blackwing: A Labor of Love or Insanity? Over the past two weeks we on the CalCedar & Pencils.com team have been in the midst of a grand experiment. 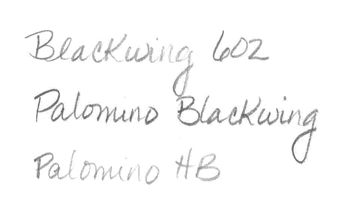 That is soliciting and evaluating the initial consumer responses to our new Palomino Blackwing pencil. This process has generated broad interest and feedback from those who participated as well as others who’ve only seen pictures and read the initial blog reviews of a few in our sampling group. Today I am initiating a series of posts over the next couple weeks about our effort to “Revive the Blackwing”. Given there is a tremendous level of detail involved in a project like this, it’s simply impossible to cover in just one or two posts and do proper justice to the subject. Today I start with a general introduction to our consumer evaluation process and provide a list of the intended posts that will lead up to definitive announcements regarding the sales launch for the Blackwing Palomino and future modifications and improvements we plan to make based on continuing feedback. Our process involved selection of a couple of control groups to gain feedback on our new product. The first group included known Blackwing fans who have had first-hand experience with the original Blackwing 602, which was first produced and introduced by Eberhardt Faber USA and eventually discontinued in 1998 by the brand’s successor owner, the Sanford division of Newell Rubbermaid. The second group consists of those less familiar with the Blackwing including those who are active pencil users and fans as well as those who may not consider themselves particularly knowledgeable about pencils at all and had never heard of the famous Blackwing 602. Those who participated were asked to complete a questionnaire that we provided comparing the two products along with our Palomino HB on a variety of performance factors. Respondents were also asked to give feedback on other aspects such as relative price and new packaging design concepts for the Palomino line. I want to thank all of those who participated directly in this process. Your extensive and detailed responses are greatly appreciated and under review. I’ll cover this all in detail in my later posts.Some also chose to blog about their review of the new Palomino Blackwing. This opened up tremendous commenting and speculation from traditional Blackwing fans, and many others with various perspectives and their own favorite pencil brand. There was a lively debate of mechanical pencils vs. leadholders, as well as those who expressed the view that this whole community of pencil fans is simply crazy. We thank all those who have and continue to participate in this interesting conversation. Here are some of the main links, sorry if I missed some:Links to some blog reviews of our Palomino Blackwing prototypehttp://blackwingpages.wordpress.com/2010/08/25/blackwing-reborn/http://mleddy.blogspot.com/2010/08/new-blackwing-pencil.htmlhttp://www.boingboing.net/2010/08/27/first-impression-of.htmlI’ve now probably reviewed several hundred comments. At times I thought to myself “no wonder Apple keeps such secrecy before they introduce new products like the iPhone 4. I must be insane! Why didn’t we just introduce the new Blackwing first?” There has been a lot of greatly appreciated support for our effort, but also some detractors too. One commenter even questioned our motivations stating “don’t toy with us Blackwing fans” in response to one reviewers personal assessment that they felt our new product failed to precisely duplicate the original’s writing performance while our existing Palomino HB was closer. I resisted temptation and kept myself from responding to speculative comments or inaccurate assumptions. I had committed myself to an open process and felt it was important not to unduly influence the feedback until our control group had responded. This should lead to the best overall understanding of those who seem to have a passion for pencils and the original Blackwing in particular. It certainly has been fascinating.Learning from this process is ongoing. In this series of posts I’ll be sharing my observations, conclusions to date and making some clarifications related to our efforts to revive the Blackwing brand. Here are the planned post topics. So what’s this thing going to cost me anyway? We’ll be opening up these posts on the Pencils.com’s What’s New blog to commenting as well as on our Facebook fan page and my Timberlines blog here. We look forward to your continued participation and feedback in this process. Hopefully by the end of this series you can all help me determine if this endeavor is a labor of love or insanity. Or perhaps it’s a bit of both. http://calcedar.com/wp-content/uploads/2010/09/Blackwings-A.jpg 269 300 WoodChuck http://calcedar.com/wp-content/uploads/2017/02/logo.png WoodChuck2010-09-07 18:39:002017-02-23 18:00:56Reviving the Blackwing: A Labor of Love or Insanity?